Broken bones and dodgy vocals? Well, Don Dokken may not be the same vocalist as in the eighties (then again, the same goes for most singers) but at least he's aware of his strength and weakness. You won't find any hi-pitch screams and overall weird performances on this record since it's definitely low key and back to basic. The 2012 version of Dokken are perhaps not the most intresting act in the world as they deliver a set of 11 songs so patchy you could make a quilt out of it. Make that a metal quilt with a skull pattern though as the guitarwork by Jon Levin -at times true to their heydays. That's right. Mr. Schlokken and Mr. Bongo (Mick Brown) are the two original members left and Levin and bassist Sean McNabb (Quiet Riot, House Of Lords, Badd Boys, Black Bart, Paul Shortino, etc.) are trying to cope with band history and various other issues such as background vocals? I couldn't put my finger on it at first but I do miss the bgv of Jeff Pilson and perhaps his contribution to songwriting? Not that it matters much since this is very much hits and misses. The first three tracks are the best in my opinion and opener "Empire" gives the false intention of the fun uptempo album. Nothing could be further from the truth though as things gets pretty ugly at track four and onward. Blimey, "Waterfall", so utterly boring it will quickly put you in a state of coma. Plodding and extremely dull leftover from Solitary? The same goes for "Victim Of The Crime", it's ultra slow metal with the complete lack of refrain or hook. The following song and dance number (Burning Tears) yet another slow/mid tempo track but not quite as dull. Next up, "Today", the Jefferson Starship hit of long gone days/daze and it's a decent attempt at bringing the hippies back to life. I truly believe it's long dead though and it's ever so laidback. "Fadeaway" yet another slow ballad and this is really getting on my nerves. The closing track "Tonight", decent attempt at coming up with "In My Dreams" part two minus a great refrain. Final verdict: I believe it's time for the fans and Frontiers (the record company) to put some pressure on the geezers for next album. 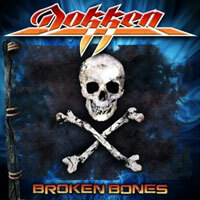 Let's face it, the record buyers are expecting more from Dokken and definitely more of the original sound. What's the point in releasing an album that's more like the boring mid-nineties anyhow? (the worst era of hard rock and metal). The FINEST HOUR: "These Are The Good Old Days"
DAUGHTRY: "Break The Spell (Tour Edition)"
JON LORD: "Concerto For Group and Orchestra"
VISION DIVINE: "Destination Set To Nowhere"